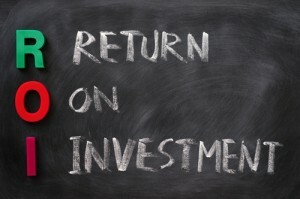 What is the ROI for Workflow Automation? When creative teams are evaluating inMotion, they understand the benefits right away – they’ll be able to spend less time on administrative tasks and more time on their creative work, all while improving visibility into projects and quality. Sounds great! … Then reality sets in. Can they justify the cost and the time it will take to implement? The short answer is yes. Now let’s dig into how you can go about making that justification. The first step is to get an understanding of the value of your team’s work. The projects that you’re completing – be it direct mail pieces, marketing emails, packaging, landing pages, or point-of-sale – have an impact on your organization’s revenue. How much of that revenue can be attributed to the work of your creative team? At best, this dollar figure is going to be an educated guess. So don’t get hung up on nailing it down to the penny. For most creative teams, this will be one to 10 percent of total annual revenue. Time spent mocking up a wireframe for a landing page leads is revenue-generating, time spent chasing down clients for approval on that wireframe is not revenue-generating and is administrative work. A meeting to brainstorm campaign ideas for a new product launch is revenue-generating. Time spent in a meeting to get status updates on the product launch is administrative work. You likely already have a good read on your team’s admin time but you can verify your guess by asking team members to simply recall (or record) how much time they spend on administrative tasks in a given week. So now you have an idea of how much revenue your team brings your organization, and how much time is wasted on non-revenue generating administrative tasks in the process. So what if you could free your team’s time from administrative tasks and reinvest that time into revenue-generating – and FUN – creative work? That’s where you’ll find the ROI for workflow automation. A workflow automation solution like inMotion can streamline your process so that tasks like updating status reports and routing proofs for approval are automated. It can remove common bottlenecks in the kick-off and approval stages of your projects, so projects get done faster. And with inMotion as your central repository of project information, you can better prioritize your projects and your resources. What does this mean for ROI? It means you’ll be able to get more projects done – projects that generate revenue for your organization. Which means implementing a workflow automation solution like inMotion can pay for itself in a matter of months. In fact, the creative teams that we’ve talked to have seen first year returns ranging from $160,000 to $890,000. Ready to find your team’s ROI for workflow automation? We’re helping creative teams gauge the value of their team’s work and forecast their productivity improvements with inMotion.